“Good as Gold: Fashioning Senegalese Women” will be on exhibit at the Smithsonian’s National Museum of African Art Oct. 24 through Sept. 29, 2019, in a redesigned first-floor exhibition gallery. “Good as Gold” is the first major exhibition of Senegalese gold jewelry to date that focuses on the history of Senegal’s gold, from past to present, and the beauty and complexity of the way Senegalese women use ornament and fashion to present themselves. “Good as Gold” also celebrates the 2012 gift from art historian Marian Ashby Johnson of over 250 works of West African jewelry to the National Museum of African Art. Johnson pursued research for several decades in Senegal, engaging a broad number of jewelers, or teugues, in interviews and extended observation. The Johnson collection is supplemented with nearly 2,000 field and archival photographs providing a singular opportunity to understand the range and complexity of gold in the West African nation. The exhibition is complemented with a selection of loans of photographs and related jewelry items from private lenders and public institutions in the U.S. and overseas. “Good as Gold” is the first in a season of exhibitions and programs at the National Museum of African Art celebrating African women’s artistic prowess. It will be joined in the spring by “I Am: Contemporary African Women Artists,” a major presentation of contemporary works in the museum’s collection by women artists. A key theme of the exhibition is the Senegalese concept of sañse (Wolof for “dressing up” or looking and feeling good). “Good as Gold” explores how a woman in a city like Dakar might use a piece of gold jewelry to build a carefully tailored, elegant fashion ensemble. The exhibition also looks at the interconnectedness of local and global expressions and understanding of fashion. 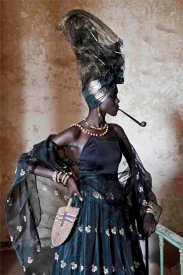 The National Museum of African Art commissioned Oumou Sy—Senegal’s “Queen of Couture” and its most celebrated fashion designer—to create a new haute couture ensemble inspired by the strength and savoir-faire of Senegalese women for the museum’s collection, which will be unveiled in the exhibition. Sy’s work has been sold in boutiques in New York, Paris, Geneva and Dakar, and featured in significant West African films and music videos. Among her many international accolades, Sy is a recipient of the Prince Claus Award. The exhibition is overseen by Kevin D. Dumouchelle, curator at the National Museum of African Art. A catalog featuring Johnson’s collection of Senegalese gold jewelry will be released to coincide with the opening of the exhibition. It will include new photography of key works in the collection and exhibition; trace the history of gold in Senegal, documenting the techniques, materials and practices of goldsmiths; and will reveal the inspirational and economic roles of women in commissioning, trading and fashioning Senegalese jewelry. Johnson has contributed an essay to the catalog on the history of gold in West Africa, Senegalese goldsmiths and their collaboration with women in the region. Johnson earned her doctorate in art history and history from Stanford University. Building on extensive fieldwork and interviews starting in the mid-1960s, as well as museum and archival research in London, Chicago, Paris and Senegal, Johnson assembled a unique collection of jewelry and archival material that highlights the delicate and refined work of Wolof and Tukulor goldsmiths and the spectacular jewelry designs commissioned by Senegalese women. Johnson, who taught art history and history at Brigham Young University, lives in Provo, Utah. Maples recently joined the North Carolina Museum of Art as its first curator of African Art in August 2018. From 2016 to 2018, she was a curatorial fellow in African and Indigenous American Arts at Stanford University’s Cantor Arts Center. At Stanford, she conceived a reinstallation of the African permanent collections: “In Dialogue: African Arts” (2016) and curated two exhibitions: “The Dancing Sowei: Performing Beauty in Sierra Leone” and “Alphabété: The World Through the Eyes of Frédéric Bruly Bouabré.” She has also served in curatorial and scholarly capacities at the Yale University Art Gallery, the National Museum of African Art, the High Desert Museum and the University of California Berkeley’s Hearst Museum of Anthropology. She has written essays, books and articles on historical and contemporary African arts, museum policies and collecting practices. Maples holds a doctorate from the University of California, Santa Cruz. Dumouchelle has served as curator at the National Museum of African Art since October 2016. He was in-house curator for “World on the Horizon: Swahili Arts Across the Indian Ocean” (2018) and the lead curator for “Visionary: Viewpoints on Africa’s Arts” (2017), the museum’s most recent, award-winning presentation of its permanent collection. From 2007 to 2016, he was the Brooklyn Museum’s curator in charge of its African and Pacific Islands collections. Dumouchelle has a doctorate from Columbia University. The National Museum of African Art is the only museum in the world dedicated solely to the collection, conservation, study and exhibition of Africa’s arts across time and media. The museum’s collection of over 12,000 artworks represents the diversity of the African continent and includes a variety of media—from sculpture and painting, to photography, pottery, jewelry, textile, video and sound art. The museum is open daily from 10 a.m. to 5:30 p.m. (closed Dec. 25). Admission is free. The museum is located at 950 Independence Ave. S.W., near the Smithsonian Metrorail station on the Blue, Orange and Silver lines. For more information, call (202) 633-4600 or visit the National Museum of African Art’s website. For general Smithsonian information, the public can call (202) 633-1000. The public can follow the museum on Twitter, YouTube, Instagram and Facebook and join in the discussion about the exhibition on social media using #GoodasGold.